IEEE Spectrum highlights the work of UW CSE Ph.D. alum (and current Yale postdoc) Zhe Xu and CSE and Applied Mathematics professor Emo Todorov, who developed a robotic hand that achieves true human-like dexterity and could serve as a model for the development of neuroprosthetics and limb regeneration research. 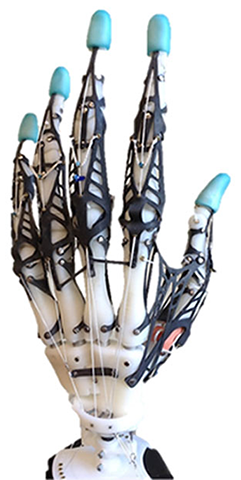 The article describes how Xu and Todorov were able to mimic the structure of a human hand using a combination of 3-D printing (bones), polyethylene strings (ligaments and tendons), and laser-cut rubber sheets (soft tissue). This is a really cool piece of technology from UW CSE’s Movement Control Laboratory. Read the full article and view a video demonstration at IEEE Spectrum here, and read the research paper here. Check out the Gizmodo article here.